This Bark River Bravo-1 has a Green Canvas Micarta handle and a full-tang CPM-3V steel blade. The Bravo-1 was developed with the assistance of the training unit of the Force Recon of the U.S. Marine Corp. These folks bought a large number of knives on the commercial market and tested them without saying anything to any of the makers. The Bark River Gameskeeper came out on top to fit their requirements of a real time general purpose survival/bushcraft knife. 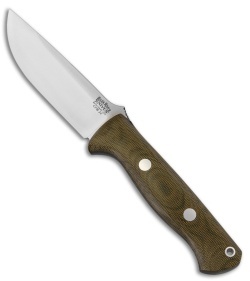 Bark River Knives were contacted by them and were asked to make a knife based on the Gameskeeper with a few changes. The Bravo-1 is the result of their input.